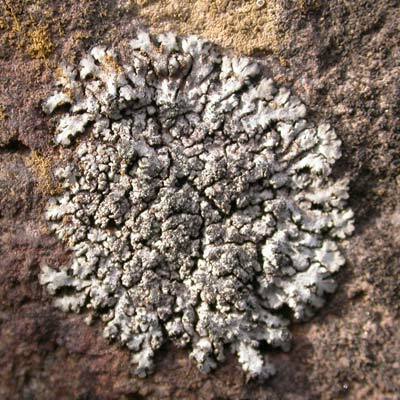 P. dubia is a medium-sized rosette-forming lichen of nutrient-enriched brick wall tops and roofing tiles and other non-calcareous habitats. In habit, it is intermediate between P. caesia and P. tenella (both described elsewhere) with a firmly attached thallus and sorediate, narrowly radiating lobes, slightly splayed at the ends. The K- medulla and lack of marginal cilia should distinguish it from all other lookalikes but P. tribacia which can also have terminal lip-shaped soralia, but usually that species has a paler grey thallus and an overlapping structure. In Ireland, the species has a scattered distribution. Soralia: lip-shaped; K- medulla, cilia absent around the edges of the thallus; enriched siliceous rock. Simms, M. J., (2016). Physcia dubia (Hoffm.) Lettau. [In] LichenIreland.